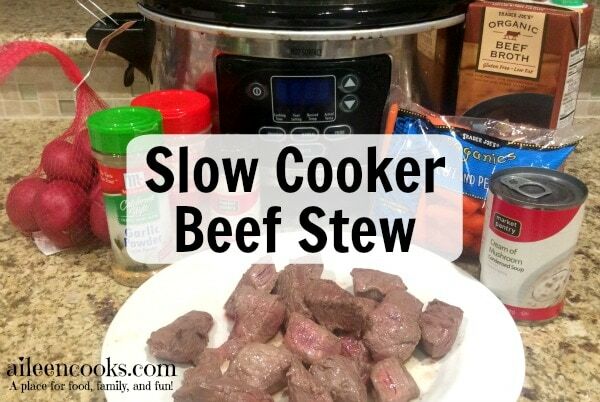 If I had to guess, I would say Crockpot Beef Stew is my husband’s favorite slow cooker meal. As I’ve mentioned before, he is definitely a meat and potato man and this recipe is full of meat and potatoes (plus carrots, so it’s win-win). A delicious slow cooker beef stew made with tender stew meat, carrots, and red potatoes. In a large pan, heat the olive oil over high heat. Add the stew meat to the pan and brown on each side - approximately 30 seconds per side. 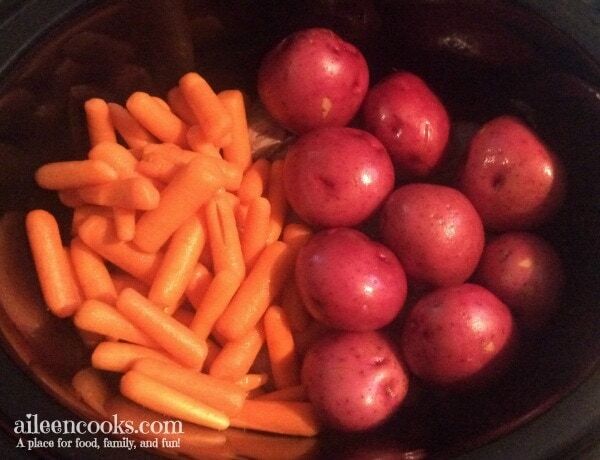 Put the stew meat in the slow cooker and top with the carrots and red potatoes. In a medium bowl, whisk together the beef broth, cream of mushroom soup, dried minced onion, onion powder, garlic powder, dried parsley, and salt. Pour the broth mixture over the carrots and potatoes. Cover and cook in the slow cooker on low for 8-10 hours. The trick to browning the stew meat is a hot pan and not moving the meat around. Place it in the hat pan and allow it to cook for 30-45 seconds without moving it. Flip and allow it to brown on the other side without moving it around after the initial flip. This recipe can be prepped and stored in the crock in the refrigerator for up to 24 hours prior to slow cooking. Sign up for our newsletter and we’ll send your our eCookbook: 10 Easy & Delicious Slow Cooker Dinner Recipes for FREE! Source: This recipe is based on a pot roast recipe my mother in law shared with me and the spice mixture is from the 100 Days of Real Food Cookbook (affiliate link). Have you tried making your own cream of mushroom? Yes! I usually make a double or triple batch and store it in the freezer. I showed this with canned because I have yet to share a recipe for homemade. ? do you make your own, Lynn? I am literally doing my meal planning for the week right now, and I just added this. I can’t wait to try it! Yum! Yay! I’m glad it made the cut!